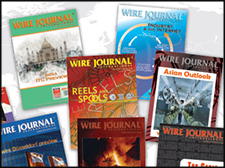 Wire Journal International (WJI) is the leading technical publication for the wire and cable industry. Published monthly, WJI is written for executives, engineers, technical and sales professionals, and purchasing agents engaged in the manufacture of ferrous and nonferrous wire and cable; electrical wire and cable; fiber optic cable; and formed and fabricated wire products. Editorial coverage includes management, marketing, and manufacturing methods, as well as technical developments related to drawing, extruding, rolling, forming and fabricating wire and wire products. The technical articles that are published in WJI have been presented during a wire and cable technical symposium at one of The Wire Association International (WAI), Inc.'s events. Display advertising is accepted in WJI. To learn more, see the WJI Media Kit, which includes an editorial calendar of upcoming feature articles. To submit material for inclusion in an upcoming issue of WJI review the Press Release Submission Guidelines for classified, advertisements, industry news, people, and WAI news.